Would like to be up to date at all times? The customer service or support section is your first port of call if you have questions regarding VITA products and how to use them, or regarding the operation and care of your VITA furnace or concerning the guarantee. From here, you can contact the central VITA Hotline, which always offers expert advice during normal business hours. The download center provides a variety of documents, images, videos and software that can be downloaded. 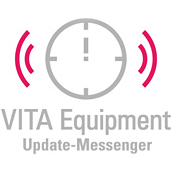 So if you are looking for operating or working instructions for a VITA product, need a software update for your VITA furnace or are a service technician looking for a service manual, all of these are available here and can be downloaded to your PC. Information on the terms of the guarantee, on how to return incorrect orders and on the delivery of electronic PCBs is also available. The "Equipment servicing" section also contains a download link to a list of the addresses and contact details for collaboration partners in your area who perform equipment servicing for VITA. Here you can register your VITA device or use the support form to ask questions regarding your VITA device. Are you having difficulties with all-ceramics or metal ceramics? In the questions and answers section (FAQ), you will find solutions that will help you correct your problems. The glossary provides explanations for important technical terms in both dentistry and dental technology. You have purchased a new VITA device such as a VITA VACUMAT furnace. You can register your new device here. Do you have a question concerning your VITA device? You can access the form here that will help you obtain the correct answer. Are you an authorized VITA service technician? Or are you looking for an equipment servicing expert in your area? Then click here. Are you looking for answers from VITA or the VITA community? Or would you like to ask a question yourself online? The FAQs are available here. Would you like to know more about VITA products and how to operate/use them, or do you have questions that the working instructions/operating instructions do not answer? Then contact the VITA hotline.